Our Brand New Easy Dunker – dunk tank have been delighting crowds for years. 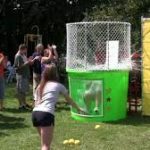 The concept of dunking the boss at the company picnic, or dunking the local “celebrity” at fundraiser events has become an American pastime. Renting the Dunk tank is Easy! And its an excellent add-on! 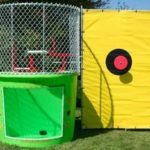 How To Reserve The Dunking Booth / Tank! All rides are subject to a delivery fee, always depending on the location. Learn more about our delivery rates.